The Fat Pitch Financials Portfolio has been off to a strong start in 2010. As of the market close on January 29, 2010, the Fat Pitch Financials Portfolio was up 1.38% for the month versus a negative 4.57% return for the S&P 500 over the same period of time. As you might recall, the Fat Pitch Financials Portfolio ended 2009 with a balance of $1,233,461.25. That balance has now grown to $1,261,199.83. I launched this paper portfolio back in September of 2004 on Marketocracy with a virtual starting balance of $1 million and a per share value of $10. I created this paper portfolio shortly after I started the Fat Pitch Financials blog as a way my readers could track my stock picks. The objective of this portfolio is to invest in companies with wide moats that are selling for prices that provide for a significant margin of safety. Over the past 12-months the FPF Value Port is up 60.84% versus just 30.10% for the S&P 500. The orange line in the graph below shows how the Fat Pitch Financials Port relative to the major indexes. As you can see, the Fat Pitch Financials Port has outperformed the major indices since the end of last spring. According to Marketocracy, the Fat Pitch Financials Portfolio has outperformed 79.2% of all other Marketocracy funds over the past 2 years. Since inception in September of 2004, the FPF Value Port produced an annualized return of 4.37% versus the 1.12% return of the S&P 500. 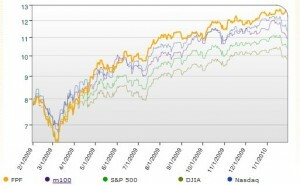 I’m proud that I’m beating the S&P 500 by 3.24%, but I hope to increase this margin substantially over the coming years. There were no new transaction in January. I’ve been waiting patiently for the market go into another panic. I looks like that could happen now in February. The major news in January is that Destination Maternity (DEST) finally turned a profit in quarter one. It also looks like Kraft (KFT) is going to Cadbury (CBY) regardless of Warren Buffett’s advice to the company. Finally, I also reported on Premier Exhibitions Investor Day Presentation in January. I’m hoping that I’ll find a fat pitch opportunity in February to put some of the $153,474.32 in cash remaining in this portfolio to work. Disclosure: I own shares of Western Sizzlin (WEST), Steak N Shake (SNS), Broadridge Financial Solutions (BR), Microsoft (MSFT), Western Union (WU), Kraft Foods (KFT), eBay (EBAY), Concord Camera (LENS), McGraw-Hill (MHP), Destination Maternity (DEST), Sotheby’s (BID), Pfizer (PFE), US Bancorp (USB), Wells Fargo (WFC), USG (USG), and Premier Exhibitions (PRXI). Up last week while market was down! Noteworthy!